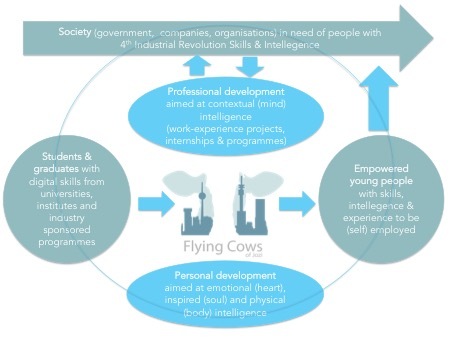 1 November 2018 – The October 2018 edition of UJ’s EduBrief featured another article on the work of Flying Cows of Jozi this time zooming in on how the personal and professional development programmes offered to our talented young teachers prepares them for the opportunities and challenges of the Fourth Industrial Revolution. Since the first Flying Cows of Jozi project in May 2018 where UJ’s BEd students trained 92 Vodacom/DBE District Teacher Development Centre managers in the use of the digital resources in their centres, more digital education projects have been added to our portfolio. One of these projects is the review and research for digitising Cambridge University Press study guides for Grades 10-12 Accounting, English, Maths Literacy and Geography. Cambridge University Press is very excited about the collaboration with Flying Cows of Jozi, in the words of publishing manager Niall McNulty: “Congratulate the team on the excellent work done. We are Incredibly impressed.” This is such a great compliment to the students and to the UJ Faculty members who brought them to where they are today! Cambridge University Press has asked Flying Cows of Jozi to assist with setting up and executing the internship programme for educational writers, editors and proof readers at their organisation. In addition to on-the-job mentoring in projects for our digital education clients, Flying Cows of Jozi asks students to participate with our “Be Here Now – Flying Cow” mindfulness programme by Lucy Draper-Clarke who researched the use of mindfulness training in Teacher Education, particularly in its ability to alleviate stress and its potential to improve teachers’ presence in the classroom for her PhD. And once a month we dance a Nia class with a certified Nia teacher. Nia combines martial arts, dance arts and healing arts, such as yoga and Alexander Technique. It’s an hour of movement set to inspiring music and develops flexibility, agility, mobility, stability and strength. Next: Next post: What brings people back to decaying inner cities?